ULTIMATUM XL6 라우드 스피커는 ULTIMATUM 프로젝트를 표시 한 모든 원칙을 준수하고 지속적인 성공을 거둔 floorstanding 디자인입니다. 혁신적인 배플 - 디커플링 기술, 'isobaric'베이스 로딩 및 트윈 EMIT 리본 형 수퍼 트위터의 사용은 ULTIMATUM의 평생 음악적 즐거움을 약속합니다. 인클로저는 각각 목적에 맞게 최적화 된 5 개의 개별 내부 캐비티로 구성됩니다. Bass와 Mid / Bass 볼륨은 튜닝에 적합하도록 커지며 HF 캐비닛은 강성을 높이기 위해 작고 Mid Bass 드라이버의 후면 압력은 트위터의 뒤쪽 챔버에 좋지 않은 영향을줍니다. 두 개의 EMIT 수퍼 테스터도 마찬가지로 격리되어 있습니다. 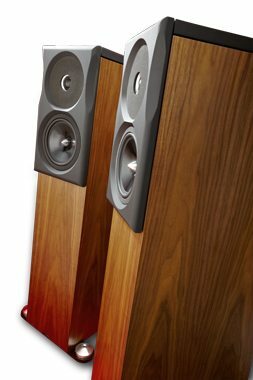 The ULTIMATUM XL6 loudspeaker is a floorstanding design which adheres to all the principles that have marked out the ULTIMATUM project and given it such enduring success. The ultra-rigid birch-plywood enclosure, innovative baffle-decoupling technology, ‘isobaric’ bass loading and use of twin EMIT ribbon-type super-tweeters are employed here to deliver the ULTIMATUM promise of a lifetime of musical enjoyment. The enclosure comprises five discrete internal cavities each optimised for purpose. The Bass and Mid/Bass volumes are large to suit the tuning while the HF cabinet is small to increase rigidity and to stop back pressure from the Mid Bass driver adversely affecting the rear chamber of the tweeter. The two EMIT supertweeters are similarly isolated.